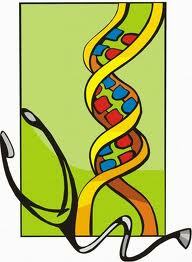 An autosomal dominant disorder would be the result of only one mutated copy of the gene. At least one of the parents of the affected person usually gets affected. 50% chance for the mutated gene to inherit. Normal "Huntington" protein replaced with the faulty protein. The faulty protein causes damage to specific areas of the brain that initially manifests as abnormal involuntary movements that become increasingly un coordinated jerky movements, decline on mental abilities, behavioral and psychiatric problems become prominent. Mostly Occurs in individuals between 35 to 45 years old. No cure unfortunately for the disease. 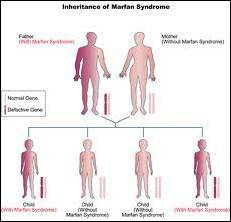 • An inherited genetic disorder mutated FBN1 gene codes for the protein fibrillin-1. • Can be mild or severe. 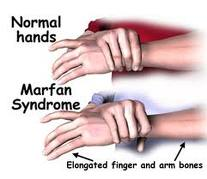 • Symptoms are long limbs, dislocated lenses and dilation of the aortic root usually have heart problems. Caused by mutations in genes on the X chromosome. Even though both Males and females affected the males typically being more severely affected than females. The chance of passing on an X-linked dominant disorder differs between men and women. Man won’t pass the disease to his sons but all his daughters would be affected. • The bodies of individuals lose the ability to coagulate blood or blood clotting. 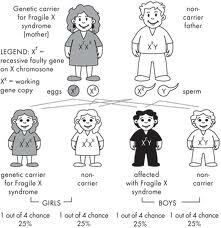 • Mutation is caused in X chromosome and the condition is recessive. • The females are carriers only and they would not get affected by this disease. 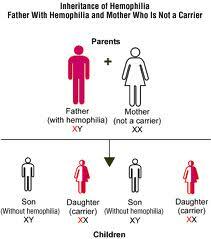 • But males suffer from the symptoms of hemophilia. 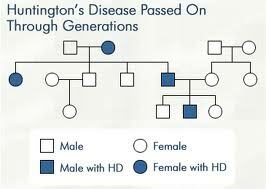 Want to know more about Genetic disorders? Click here to schedule live homework help from a certified tutor!